While we’ve been asked a lot about the exciting experiences we’ve had in Southeast Asia over the past few months, people also ask about handling some of the more mundane parts of life. And one of them is how to deal with washing clothes while traveling. For the occasional or short-term traveler, doing laundry while traveling isn’t really an issue. Pack your bag with a week or two of outfits, then wash everything when you get home. If worst comes to worst and you get a stain on something, you can visit a dry cleaner or retire that piece of clothing for the rest of the trip. But it’s not so simple for long-term travelers. We’re actually not carrying much more clothing on this indefinite journey than we would on a weeklong trip (otherwise we’d get crushed under the weight of our backpacks). So we have to find a way to do laundry pretty much every week, wherever we’re at. 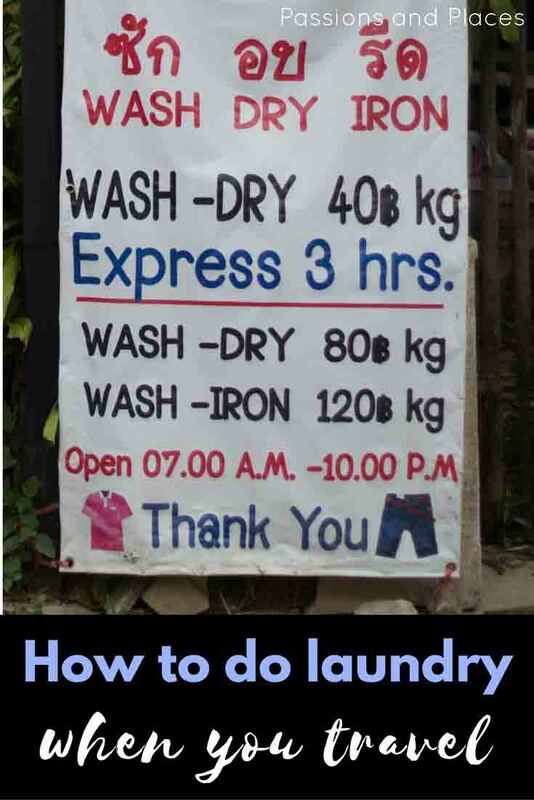 The options for washing clothes while traveling can be different in different regions of the world, and some of them are cheaper and easier than others. But these are the ones we’ve seen and used, both on this trip and during previous travels in Africa and the U.S. The best method for you will depend on your budget and time available (and importantly, whether you have more money or more time! ), as well as where your travels take you. If you’re traveling in the West or even in Southeast Asia, it might be possible to find a washing machine (and maybe a dryer, if you’re lucky!). One of the simplest options is obviously to visit a laundromat. In the U.S. and many other Western countries, this is a cheap and simple solution. It’s what we did in Mississippi during our road trip through the Deep South earlier this year. For a couple bucks, you can throw your laundry in an industrial-sized washer and dryer, read a book (or write a blog post!) for an hour and a half, and out pop your clean, fresh-smelling clothes. 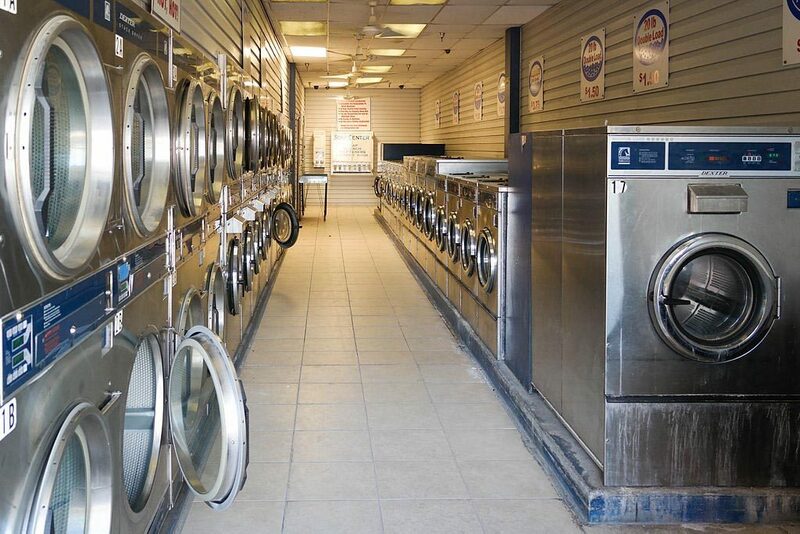 In other countries, though, finding a Western-style laundromat might not be so easy. 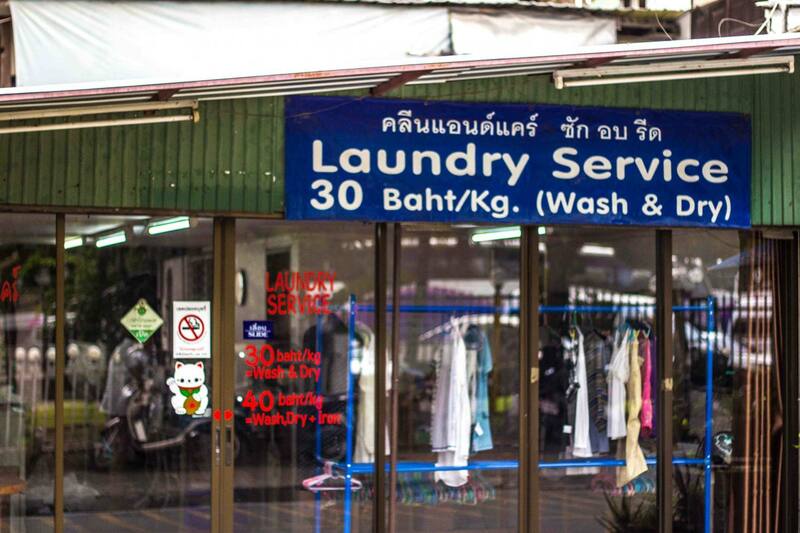 We were lucky enough to find them in Bangkok and Chiang Mai, as well as Georgetown, Malaysia, but so far those are the only places we’ve seen laundromats with washers AND dryers. But many towns in Southeast Asia have laundromats with washing machines only, sometimes accompanied by drying racks. Hanging your clothes to dry can take most of the day, but visiting these Asian-style laundromats is still less work than most of your other options. Perhaps the easiest way to get free self-serve laundry is to book a house or apartment on Airbnb. The website’s filters let you search for properties with washers and dryers, making it easy to see if one’s available. Even if you only reserve a room instead of a whole house, the homeowner might still let you use their washing machine – just check the listing or ask before booking. We’ve stayed at several Airbnbs with washing machines, although (like laundromats) homes in Southeast Asia rarely have dryers. 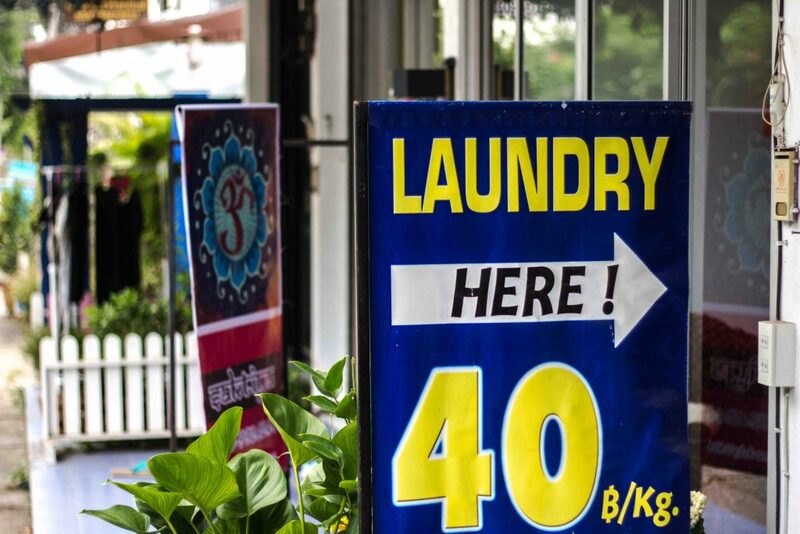 The majority of hotels don’t have self-service laundry, though we’ve been lucky to stay at a couple in Thailand that did (no dryer, of course!). But if you’re traveling in the U.S., many more hotels have laundry facilities. Residential hotels like Extended Stay America always have coin-op washers and dryers, making it easy to do laundry while traveling. Contrary to the name, you don’t actually have to make a long-term booking at the hotel, and many of them don’t cost much more than a standard room. More traditional hotel chains sometimes have laundry facilities too, just check before you book. If you’re in a more rural area or a country with less infrastructure, hand washing your clothes may well be the only option. This is a less conventional method we’ve used in Southeast Asia, and I like it quite a bit. Some people say you can use a plastic grocery bag, but a vinyl dry bag makes much less of a mess. Better yet, invest in something that’s actually made for doing laundry, like the Scrubba wash bag. We got one before we left, and it’s made things much easier. It has a little valve to remove excess air before starting the scrubbing step, and the inside surface is coated in plastic nubs that help massage the dirt out of your clothes. Whatever type of bag you’re using, fill it with water up to the halfway point, and toss your clothes in. 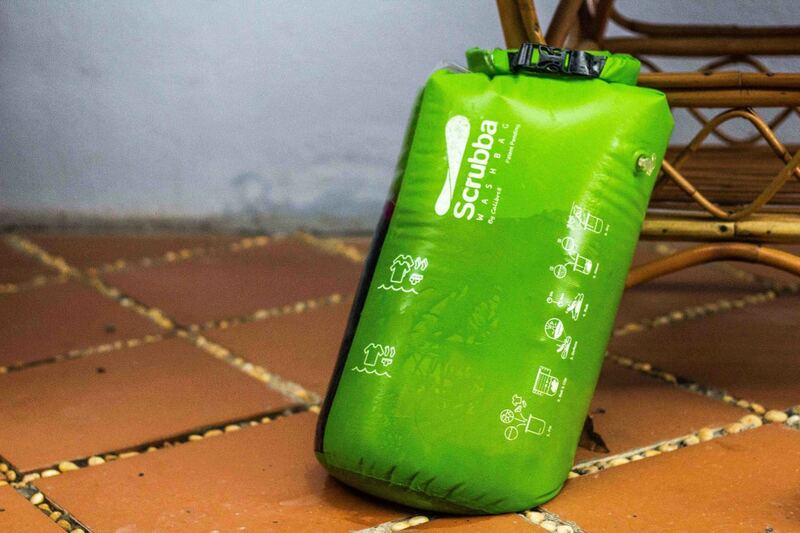 The Scrubba holds the equivalent of about six T-shirts, so not a full washing machine load of clothes, but more than you could put in a sink. Next, add your powdered laundry detergent (and do buy the powder – a packet or bottle of the liquid kind is just asking to make a soapy mess in your backpack). Let the clothes soak for a few minutes and then massage the bag for a few more, before rinsing each article of clothing in fresh water. The whole process takes ten minutes or so. It’s a good idea to do it in the shower or bathtub, where it’s okay to get things wet. Many showers in Asia also have a spigot that’s separate from the showerhead, which makes the rinsing step easier. Most travelers are well-versed in the sink method because you can wash your socks and underwear every few days and just re-wear the other clothes. This is great if you’re only traveling for a couple of weeks (or just don’t want to visit the laundromat as much) because the only thing it requires is a drain plug, if that. Fill the sink with water, add your clothes, and dump in the detergent. Let the clothes soak a little and then rub them together for a few minutes. Drain out the soapy water, and give everything a good rinse in fresh water. If you have a full bathtub to work with, it’s possible to wash all your clothes at once, but a sink is really only big enough for smaller items. For just washing a few small things, you don’t even need to fill the sink up. Just get each item wet, pour some soap directly on it, rub, and then rinse under running water. You’re already wet; why not wash some clothes while you’re at it? Showers are a perfect, no-mess space to wash your clothes, especially smaller things. The downside is that you won’t have a way to soak them, but it’s not bad for shorter trips and doesn’t require any extra equipment. Southeast Asia seems to be full of places that offer laundry services, and unlike dry cleaning or other laundry businesses in the U.S., it’s quite budget-friendly. The going rate in most places we’ve been is around $1 per kilogram of clothes. Many hotels have a laundry service too, which may be priced by weight or per item, but they’re usually more expensive. Admittedly, there are lots of stories of people entrusting their clothes to these businesses, only to find all their whites newly tie-dyed or tinted pink and shirts stretched into muumuus when they’re returned. But if there’s no laundromat and you don’t like the idea of scrubbing your clothes with your own two hands, this is the best option. My merino wool T-shirts from Woolly and polyester pants from Bluffworks dry much faster than Jen’s knit tops and denim shorts. This makes a big difference in a humid climate, where clothes will start to smell bad if you can’t get them dry in one afternoon. Unless you know you’ll be someplace where dryers are common, it’s a good idea to bring a clothesline. One popular option among travelers uses a braided rope that pinches each article of clothing so you don’t need clothespins. We brought along a few lengths of parachute cord, a very strong, thin nylon rope that can also be used to tie your backpack to a roof rack and during your adventure. We don’t bother with clothespins, and just fold each item over the rope. 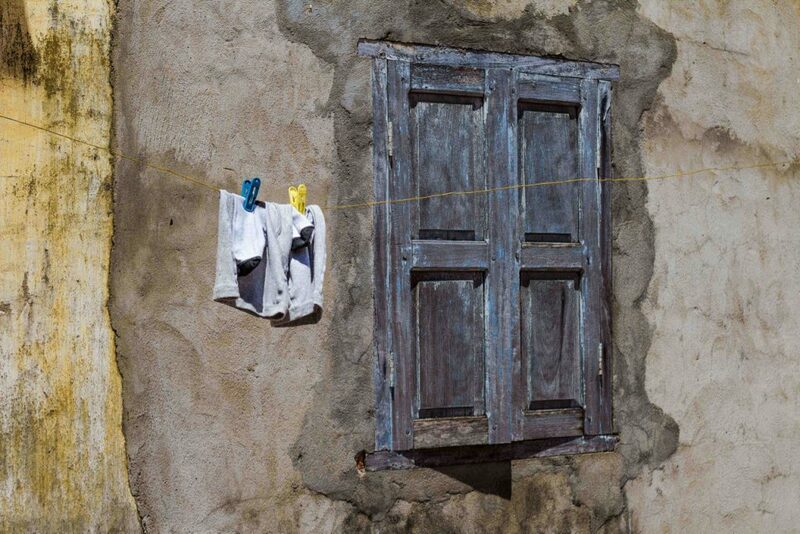 Sometimes accommodations or washing machine-only laudromats will have a clothesline hung up for you to use. 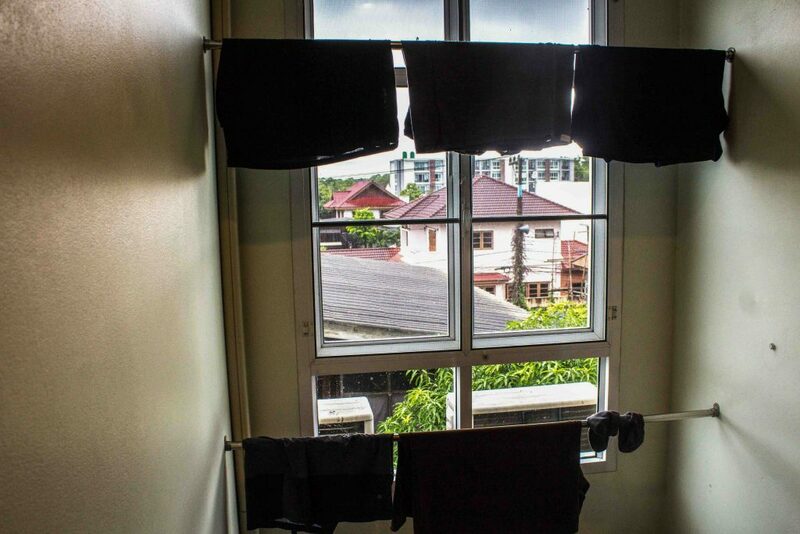 Hanging clothes inside to dry seems counterintuitive, but though Southeast Asia is hot and sunny, it’s also extremely humid. Your clothes will dry faster in an air-conditioned room than they will outside, even if hanging a clothesline indoors feels ridiculous. The willingness to do laundry while traveling can drastically cut down on how much stuff you’ll have to lug around with you. Believe me, travel is more fun when you aren’t carrying a bunch of heavy luggage (and it may cut down on your fees when flying). Washing your own clothes can also save some money over time – and that’s cash that’s better spent on less mundane activities. 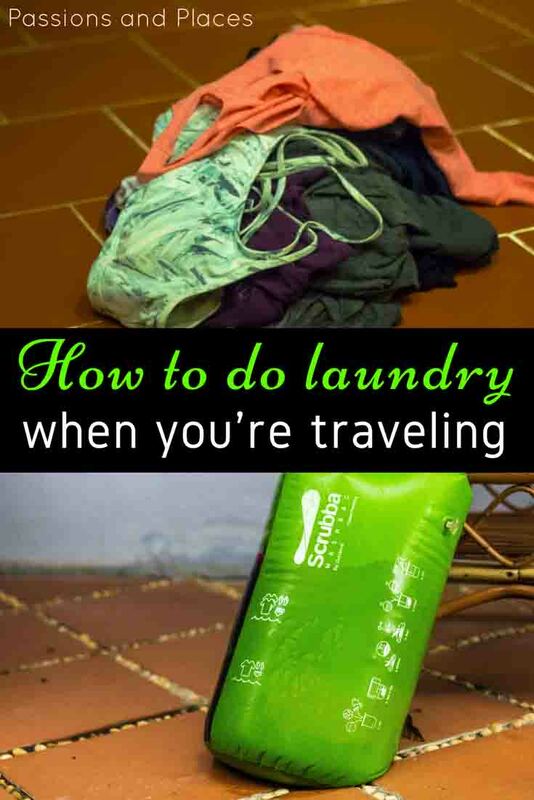 Do you have any tips for washing clothes while traveling? Share them in the comments! It’s certainly more work than throwing it all in the washing machine, but you get used to it just being a weekly chore. 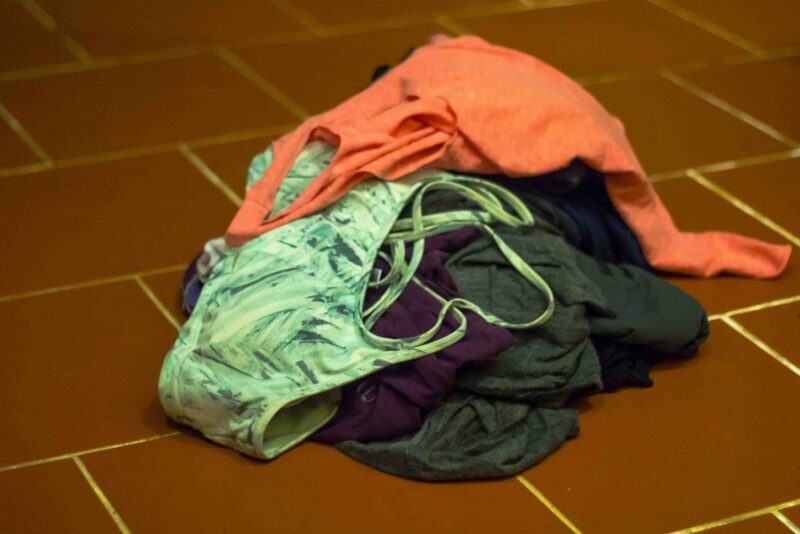 i have never tried washing my clothes during a trip (although i thought about it when i had to stay for 18 days in sydney but this article has been incredible useful! thanks for sharing! I never bring more than a weeks worth of clothing on a trip, but until we started our journey through Southeast Asia, I just used the sink or shower methods. I’m a sink washer but we’re usually only traveling for a couple of weeks at a time so it works fine. I’ve never heard of those bags but I like the concept! The Scrubba bags are overpriced, but every once and a while they go on sale on Amazon. Dry bag washing is great though. This is a good post about something most people don’t think about when travelling. When we travel in SE Asia we always wash underwear in the shower – kill two birds with one stone! That was my go-to method in India, and it worked pretty well. I like the dry bag method now because I can soak the clothes in detergent before scrubbing them. I loved using those laundry place in south east asia where it would only cost a couple dollars for a full load of washing. Then just pick it up later when its been washed, dried and folded. Even though I am a dirty backpacker most the time it make me appreciate clean clothes so much more! It is nice, but I’m put off when they charge by weight or item (more common in Africa). If we’ve got a full load of laundry, which might weigh 8-10 kilos, it’s hard to justify the $8-$20 cost. I know my clothes end up cleaner than using the bag method, but it’s just too much. Big fan of the self-service laundromats we found in Chiang Mai and Penang though. Great post! Sometimes tips for the less glamorous side of traveling are the most important!! Long-term travel has a number of less-than-glamorous aspects to it, but hoping people will see that they can make it work.